There are (at least) three strategies available to the science denialist. First, you can try to pretend that science supports your position by cherry-picking the scientific literature or quote-mining; second, you can try to argue that the science “isn’t settled yet”, usually by finding a crazy loner with questionably relevant credentials who disagree with the overwhelming consensus; or – the most common one – you can fall back on conspiracies: Scientists know or suspect the truth, but are either too afraid of their reputations to investigate radical alternatives (since nothing will bar you from fame and recognition or a Nobel prize more effectively than discovering something new) or simply paid to hide it from the general public. 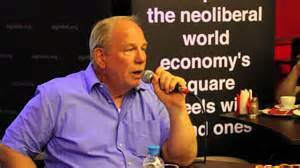 William Engdahl is not afraid to appeal to conspiracies when science doesn’t yield the results he wants, and has made a bit of a career out of it as a freelance journalist and an “independent” historian, researcher and author of books like Myths, Lies and Oil Wars and Full Spectrum Dominance: Totalitarian Democracy in the New World Order. Engdahl is a long-time associate of the LaRouche movement and has, in fact, written many articles for their publications. Many of his writings concern oil and international politics and economics relating to oil. To assess the value of his output, one should probably notice that Engdahl is a “peak oil denialist”. In fact, Engdahl is a proponent of abiotic oil, the idea that petroleum is not biological in origin and hence that peak oil is a politically motivated conspiracy to … well, you know, some vague gestures about controlling people. Conveniently enough, Engdahl is also a global warming denialist; according to Engdahl, global warming, like peak oil, is merely a “scare” and a “thinly veiled attempt to misuse climate to argue for a new Malthusian reduction of living standards for the majority of the world while a tiny elite gains more power.” GMOs, on the other hand, are dangerous, and the fact that science is in pretty much agreement to the contrary can easily be explained away by appeals to corporation-driven conspiracies (he doesn’t hesitate to cite the few studies that point in a direction he has already determined that studies ought to point in – we’re talking experienced denialism here). He’s even written a book on the topic, Seeds of Destruction. The Hidden Agenda of Genetic Manipulation, which does precisely what you think it does: Start with the conclusion Engdahl wants to defend in the face of scientific consensus; cherrypick and selectively quote studies that can conceivably be used to serve his agenda, and dismiss the rest by appeals to conspiracy theories, where the evidence for a conspiracy consist precisely of the fact that the vast majority of scientists disagree with Engdahl (who, again, has no relevant expertise on the issues in question). In a 2011 interview with Russia Today Engdahl stated that the 2011 Egyptian Revolution was orchestrated by the Pentagon to facilitate Barack Obama’s Middle East foreign policy: “The ultimate goal of the US is to take the resources of Africa and Middle East under military control to block economic growth in China and Russia, thus taking the whole of Eurasia under control.” And the Arab Spring was a plan “(...) first announced by George W. Bush at a G8 meeting in 2003 and it was called ‘The Greater Middle East Project’.” Don’t let details, evidence and reason get in the way of a good conspiracy theory, shall we? Diagnosis: The kind of guy Jerome Corsi and Tom Bethell turn to for information. A total joke, but that doesn’t mean that he doesn’t possess some influence over the weak of mind or the seriously misinformed.